Bit error ratio measurement of a PAM4 signal, contrary to conventional NRZ data format, has presented some unique challenges. To date, all BER measurements of PAM4 signals demonstrated so far are restricted to 32 GBaud or below. For the all-important data rate of 56 GBaud and higher, only error estimates from oscilloscopes had been shown to be feasible. However, despite the many helpful and informative values a state-of-the-art oscilloscope can provide, after all the real measured Error Rate (ER) remains to be the most important value to determine the quality, performance and compliance of the incorporated components (the DUTs) in a transmission link. Now, SHF is the first to announce a unique solution which enables accurate BER analysis at 56 GBaud and higher by introducing the SHF 11220 A PAM4 Sampler. The key element of the PAM4 Sampler is an ultra-high speed and ultra-sensitive 3R regenerative integrated circuit chip. It samples the three PAM4 eye openings, one at a time, and outputs a perfectly clean NRZ signal with the same information as the sampled signal. The actual error counting is done in NRZ format in the SHF 11104 A Error Analyzer connected to the PAM4 Sampler’s output. Although physically the SHF 11220A PAM4 Sampler and the SHF 11104 A Error Analyzer are two separate devices, the complementary software unifies the two parts to virtually one single Error Analyzer. The sampler is small and light weight. It can be regarded as a ‘remote head’ and placed close to the DUT, eliminating the need of long lossy cables. Since the sampler has already determined the error status of the signal, the output NRZ signal can be connected to the EA by the use of long RF cables, thus making it easy to place it wherever required (even on a wafer prober). By addition of the external PAM4 sampler, existing 60/64 Gbps “NRZ Error Analyzers” (SHF 11104 A) can be upgraded to ≥ 56 GBaud PAM4 operations at customer’s site without any downtime. This approach is fully applicable to higher order PAM signals like PAM5 or PAM8. To perform BER measurements of the PAM4 signal using the sampler at the input, the mode of operation of the SHF Error Analyzer remains unchanged. The combined instrument performs the routine auto-search to determine the optimum threshold values of the individual eyes, then successively samples all three eye openings of the 4-level signal, one at a time, and measures the three individual bit error rates. Based on this 3-pass measurement, the software calculates the total bit error ratio (BERTotal). A quick auto search in the sampler finds the optimum sampling points. Above picture is not a BER measurement. With a multi-channel Error Analyzer (we actually can offer) it is possible to analyze all three PAM4 eyes at the same time. However, this is not to be recommended because of the need to split the PAM4 signal into three copies. This process leads to significant deterioration of the resultant signal. Our ‘3-pass’ error measurement approach with the high speed remote head sampler helps to preserve the true quality of the input signal by minimizing the need for long cable connection, and a single error analyzer to keep the equipment cost to a minimum. 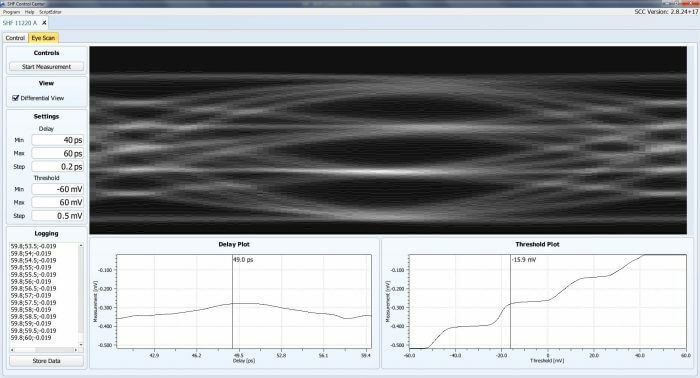 The SHF error analyzer can handle both user-defined patterns and PRBS data. In the case of user-defined patterns, pattern length of up to 8 Gb per channel can be supported. For PRBS data, pattern lengths of up to and including 231-1 are supported. For data streams generated from PRBS data without any encoding, the SHF 11104 A Error Analyzer features an internal hardware decoding mechanism where the EA synchronizes its internal reference generators to the two data streams coded into the PAM4 signal. In this mode the EA is able to detect data generated from a PRBS data streams even up to PRBS 231-1. However, this approach is not applicable to coded data like PRBS13Q or PRBS 31Q. For coded PAM4 signal like QPRBS13 or non-PRBS patterns like SSPRQ the EA operates in real time user pattern mode where the Error Analyzer will capture and store the first incoming bit stream into its internal memory. Subsequent incoming data is compared to the data stored within the internal memory. Therefore it is possible to measure a continuous bit stream without any gaps and the user does not need to load an externally created pattern into the Error Analyzer. The maximum available user pattern is 8 Gbit with a granularity of 1024 bits. The SHF 11104 A Error Analyzer with its 32G PAM4 measurement features has been shipped to many customers around the world. The SHF 11220 A is available since June 2018 and the full data sheet can be downloaded in the Extender & Remote Heads section on our BERT product page.